Your hands can say a lot about you. They can hint at your age, your marital status, your cleanliness and even your overall state of health. Rather than let your hands make a bad impression, read on for some tips on how to obtain beautiful, healthy hands! By now, washing your hands should be a no-brainer. Keeping your hands clean not only helps stop the spread of germs, but also helps you avoid getting sick. In addition to washing your hands, try a hand scrub in order to exfoliate dead skin cells and increase circulation. Nail biting and nail picking not only leaves your hands looking cracked and battered, but these pesky habits can also lead to infection and disease. Try coating your nails with a particularly bitter-tasting polish, or trimming them short in order to remove the temptation. If you still find yourself picking and biting at your nails, you may want to try a stress relieving exercise, such as yoga or meditation. Applying a hand cream is one of the beast things that you can do for your hands. When using the hand cream, don't forget to rub it into your nails and cuticles. To make your hands look more youthful and soft, look for a hand cream with sodium hyaluronate, like the Dermalogica AGE Smart Multivitamin Hand And Nail Treatment. When filing your nails, file in one direction and round the tip slightly. Pay special attention to your cuticles. Rather than cut them, which puts you at risk for infection, push them back gently after moisturizing to maximize the appearance of your nails. Prior to selecting the perfect shade, you'll want to put two coats of base coat. The first coat should focus on the top half of your nail, while the second coat covers your whole nail. 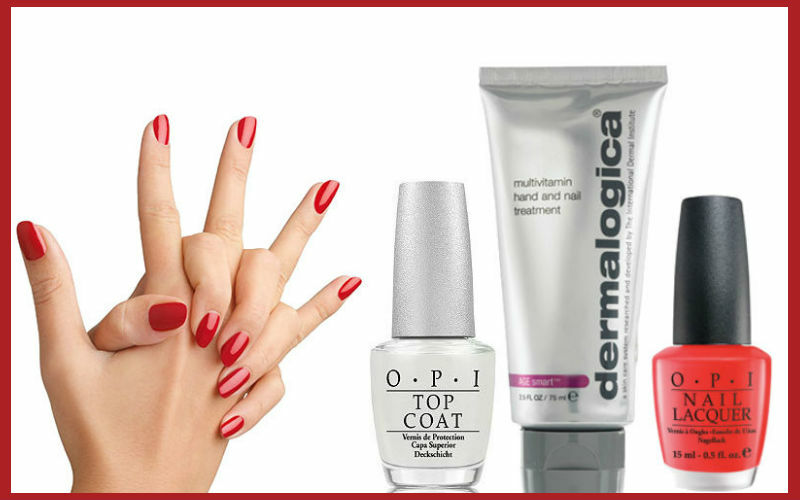 After letting that dry, apply a few coats of your favorite polish and allow your nails to dry. It may seem like overkill, but your nail color will last a lot longer and shine a lot brighter if you apply a clear top coat. Whether you’re a salon junkie or the DIY type, remember to keep up the good work. Start by giving yourself a manicure every two weeks and alter your routine from there. Remember, healthy hands are beautiful hands!